Phyllis June Nimmo, resident of Ponca City, died Thursday, Nov. 22, 2018 at her home. She was 84. Visitation will be held on Tuesday, November 27, 2018 from 4 to 6 p.m. at Trout Funeral Home. Services are scheduled on Friday, November 30, 2018 at 11 a.m. at the Agent Mallory Martin Chapel in Sallisaw. Born on October 10, 1934, in the Brent Community, Sequoyah County, Oklahoma, to John Wesley Patrick and Pauline Ida Fargo, Phyllis attended school in Sallisaw and graduated from Sallisaw High School in 1952. She was named the football homecoming queen in 1950. She married Billy Joe Nimmo, the love of her life, on May 3, 1952, in Van Buren, Arkansas. They lived for a brief time in California before moving to Ponca City in 1962. She built Ponca City Nursing Home in 1962 with her husband, which they owned and operated until retirement in 1998. They also bought the Highland Nursing Home in 1973 and she had a hand in establishing Nimmo farms. Phyllis loved to bowl and participated in state and national tournaments. She was vice president of the Ponca City Women’s Bowling Association for 20 years and a member of the Hall of Fame. She also enjoyed to travel in their motor home and loved to golf. 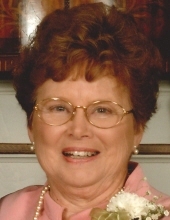 She was a member of both Ponca City Country Club and Lew Wentz Ladies Golf Assocation. Phyllis also enjoyed genealogy. Most importantly, she loved spending time with her family. She is survived by her husband, Billy Joe Nimmo, of Ponca City, children Joe Michael Nimmo, Wesley Ernest Nimmo and wife Judy of Ponca City and Patricia June Nimmo, all of Ponca City; grandchildren Tara Janelle Miner and husband Jeremy of Ponca City, Jennifer Ann Martin and husband Blake of Stigler, Joe Michael Nimmo Jr. of Jacksonville, Fla., Daniel Kent Nimmo of Ft. Lauderdale, Fla., John Wesley Nimmo of Oklahoma City, Cari Dawn Lehman of Edmond, Kaycee Nimmo and Cole Patrick Nimmo of Norman; great-grandchildren Michael Tanner Prince, Bryce Allen Miner, Maggie Ann Martin; one brother, Donald Ray Patrick and wife Maxine and many nieces, nephews and friends. Casketbearers will be her four grandsons: Joe, Dan, John and Cole. In lieu of flowers, please make donations to the Ponca City Humane Society, 900 W. Prospect Ave., Ponca City, OK 74601 or Hospice of North Central Oklahoma, 445 Fairview, Ponca City, OK 74601. To send flowers or a remembrance gift to the family of Phyllis June Nimmo, please visit our Tribute Store. "Email Address" would like to share the life celebration of Phyllis June Nimmo. Click on the "link" to go to share a favorite memory or leave a condolence message for the family.